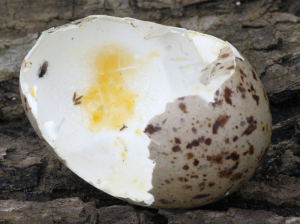 Observation - bird egg - UK and Ireland. Description: Which bird egg is this, slightly smaller than chickens egg. Also is it likely the chick got out alive or did the crows get it and can you tell from the shell? Which bird egg is this, slightly smaller than chickens egg. Also is it likely the chick got out alive or did the crows get it and can you tell from the shell?